You know what would look better on this box? The bar. "You knew it must come to this, sooner or later, Toad," the Badger explained severely. "You've disregarded all the warnings we've given you, you've gone on squandering the money your father left you, and you're getting us animals a bad name in the district by your furious driving and your smashes and your rows with the police. Independence is all very well, but we animals never allow our friends to make fools of themselves beyond a certain limit; and that limit you've reached. Now, you're a good fellow in many respects, and I don't want to be too hard on you. I'll make one more effort to bring you to reason. You will come with me into the smoking-room, and there you will hear some facts about yourself; and we'll see whether you come out of that room the same Toad that you went in." "That's no good!" said the Rat contemptuously. "Talking to Toad'll never cure him. He'll say anything." They made themselves comfortable in armchairs and waited patiently. Through the closed door they could just hear the long continuous drone of the Badger's voice, rising and falling in waves of oratory; and presently they noticed that the sermon began to be punctuated at intervals by long-drawn sobs, evidently proceeding from the bosom of Toad, who was a soft-hearted and affectionate fellow, very easily converted -- for the time being -- to any point of view. "Sit down there, Toad," said the Badger kindly, pointing to a chair. "My friends," he went on, "I am pleased to inform you that Toad has at last seen the error of his ways. He is truly sorry for his misguided conduct in the past, and he has undertaken to give up motor-cars entirely and for ever. I have his solemn promise to that effect." Of course, this scolding doesn't take, and a few short lines later, Mr. Toad has repented of his repentance, but never mind that. In a lot of ways, the Nintendo DS has acted like Badger, scolding the PSP's Toad into doing something less reckless and more productive with itself. 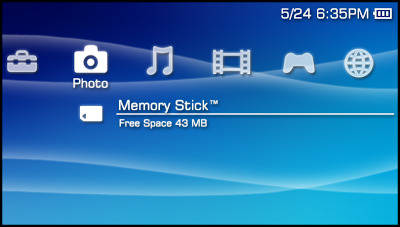 Look at how the PSP's squandered its inheritance, throwing away the PS2's hard-earned dollars on stupid proprietary format slots and optical disc drives! That's not a portable system; that's a mobile workstation! It's a console without a TV set. It's all excess. For shame! 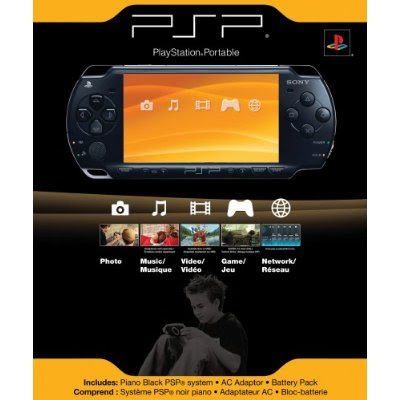 And of course now rumors are circulating that Sony may be releasing a new UMD-less PSP soon. And if they aren't, then obviously my Wind in the Willows analogy is perfect. But forget all that. What I'm really interested in here is the subtle (?) 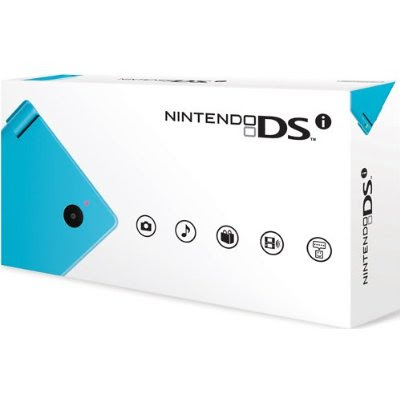 way that Nintendo's marketing the DSi, the new successor to the DS and DS Lite. The new portable has a few features not seen in previous DS models, like its two cameras, its SD card slot, its ability to play music, that sort of thing. Naturally Nintendo wanted to capitalize on those new features, and so the DSi presents itself as a multi-purpose portable gadget, not just a gaming system. Look at the picture at the top of the post again, and you can see how Nintendo represents the DSi's capabilities on the packaging. Hmmmm. This isn't a difficult observation to make, but Nintendo is horning in not only on Sony's niche (which arguably was Apple's niche before Sony expanded the portable media player concept to include video games, and which may become Apple's niche again) but also on Sony's brand. That familiar "XrossMediaBar" look is in full effect on that DSi box, just Nintendoed up a bit, what with the softer colors and the minimalist Apple/Wii aesthetic. If you aren't familiar, the XrossMediaBar is the thing in the blue picture up there. It's this row of icons that lets you select categories of functions that expand into columns so that you can then choose specific items. It's well known from its implementation in the PSP and the PS3, and now it's even being used in several of Sony's HDTV sets, cameras, and apparently newer VAIO laptops. It's iconic. It's Sony's. I would also think it would be distinct enough that Nintendo's obvious appropriation could be interpreted as some sort of infringement. I mean, I love Nintendo's moxie, but this seems risky to me. Playful, cheeky, fun, even great, but risky. So what I'm wondering is, how aggressive is Sony's legal department when it comes to stuff like this? Is this potentially actionable? Or am I just making too big a deal about something no one else will be interested in? Picture credits: DSi and PSP packaging from Amazon.com (lazy me); XrossMediaBar from crystalxp.net. I am writing to assure you that the ten-day moratorium on new Nuclear Houseplant posts is just a temporary kink; as one of the approximately 1.2 billion ABD grad students worldwide, I am working just now to get through my dissertation, and I have been working hard on getting a final draft of one of its chapters out to my advisor. I do have new content coming, so please keep checking your RSS or Google Reader or clicking your bookmarks bar. Here are some quick thoughts in the meantime. Really quick, in fact! Today's post will probably be more bloggy than anything else I've ever written here. Lately, I've been re-reading Watchmen for the first time in several years; I'm astounded by how young I must have been the last (and I'm mildly embarrassed to admit, first) time I read it, because while I really did love it the first time, I now find myself truly invested in these complex, damaged individuals in ways that I don't remember having been the first time around. I do remember feeling deeply saddened by the segment of the narrative focused on Dr. Manhattan last time, and it has even more power for me now, but then, the other characters' narratives are no less fascinating. I commented in an earlier post that Alan Moore could probably swipe the temper tantrum method from Hideo Kojima (since that's how Metal Gear Solid 2 is sometimes portrayed), but I've realized that, amusingly enough, some of the bizarre direction of MGS2's plot is actually sort of like Watchmen. I think. I'll have to see. Anyway, that's not to say that Watchmen is anything like the same beast, just that one of the major questions it asks is one that's crucial to MGS2. That hardly makes Watchmen a temper tantrum, obviously. One thing that's really great about the book is the way that Moore suggests the interconnectedness of the various plot strands, which I think is crucial to the book both thematically and in terms of the narrative, through the seamless transitions between scenes in almost every moment of the book. It feels gimmicky, until you realize that there really is a purpose to this kind of interconnection, which, if you weren't clued in before Chapter III, surely you'll be getting the idea by the time the newsstand guy is talking about it. 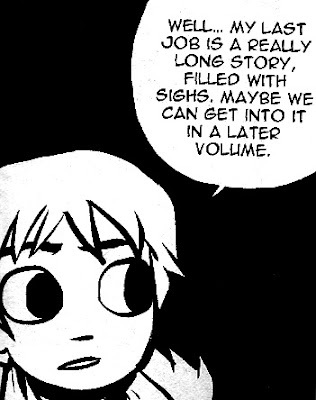 Also, enjoy the Pessimistic Pirate Comics in that chapter, if you're planning on reading this thing. And you should; I commend this as highly as possible. 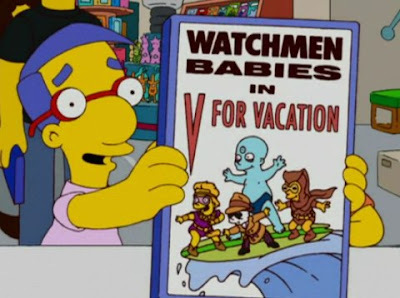 Finally, I'm struck by the maybe unexpected way Watchmen sticks to the norms of the superhero genre. There isn't much action in any given section until fairly late, but what there is is a ton of complex, intertwining, non-linear narrative. It's a soap opera, in some ways, though I mean this in terms of the narrative's progression and complexity, not in any negative sense. Which isn't to dismiss soap operas, but come on. You know what I mean. A few years ago, my (not then) wife and I were having a conversation about superhero comics, and I was explaining a handful of plot threads from the 1970s era of Amazing Spider-Man. These centered mostly on Gwen Stacy and the Green Goblin, with a few footnotes (you should never get into a conversation with me in real life) on the post-"death" career of Norman Osborn. Carrie observed that, at least from what she was gathering from my synopsis, Spider-Man sounded like a big soap opera. And it is; that's what's so fascinating about superhero comics. The action, hey, whatever. It's the serial exhibition of Peter Parker's messed-up life we're all there to see. And that's such a huge part, really the part, of Watchmen. It isn't just a parody of the superhero genre in the sense of sort of twisting our expectations; it also, as parody sometimes should (when it can do so well), takes the conventions of the genre and blows them up to humongous proportions. It's amazing. So please, please, for heaven's sake, read Watchmen. You don't have my permission to go see it until you've at least read the book, and maybe not even then, ugh. Read it. Read it now. So, I didn't realize I'd be doing this, but after a weekend spent in large part at the New York Comic Con (NYCC to you pros out there), I've decided I need to open up a new section—I'd call it a column, but that sounds so pretentious when this is my personal blog and I'm the only writer in the bullpen—dedicated to comics and the like. Comic books. 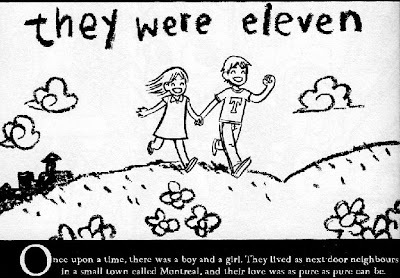 Graphic novels. Graphica. "Illiterature" (thanks, Graphica and Education conference!). Whatever the hell they are. Anyway, so much of interest happened this weekend that I've come home with at least three posts I want to write, and I'm going to get right on those. But I felt they needed some space of their own here, a little niche they could fit into, so here it is. I've lived with and loved comic books as long as I've lived with video games, and though I'm sure there are some who'd cringe to hear me say this, the two have played similarly huge roles in shaping me. So, out of deference to the other of my two ghettoized medium loves, I thought I'd throw this new section up, stick the above graphic at the beginning of every pertinent entry, and . . . yeah. Pretty much that. Do you want to know what a "mechanical tint" is? It isn't something you'll find a picture of on the internet, at least not by that name. At least not where Google Image Search can find it. But a mechanical tint is the system of stripes, dots, jaggedy lines, or whatever that printers used to use to represent tones between straight black and straight white in, e.g., newspaper illustrations. Since I couldn't find any mechanical tints on the internets, I went for a halftone with the Mechanical Tints logo over it. So there's that. Anyway. Aren't you glad you read this? As I mentioned in the previous Whapocalypse? post, another game I've been playing, now that I've realized my iMac has the power to run some of the higher-profile recent releases, is Fallout 3. Fallout 3, like Left 4 Dead, is set in a ruined world, but this time, it's not a zombie infestation but a nuclear war between the U.S. and China that's devastated this country and presumably the rest of the world. 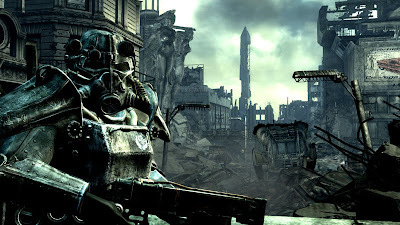 Specifically, Fallout 3 gives the player the opportunity to range through the desolate wilds of the D.C. area, referred to in the game as the Capital Wasteland, which bear some degree of similarity—topographically not aesthetically!—to the real-world Washington. In fact, the use of Washington as a post-apocalyptic setting caused some controversy as the game was released; an angry letter appeared in the Washington Post after a reader took offense at Washington Metro ads for the game (the ads prominently featured the graphic above), and Todd Howard, the game's executive producer, went to some pains to assure Stephen Totilo that the game's release date (October 28) was not intended to coincide with the presidential election, and the game's content was not intended as any sort of political statement. However, Totilo did put together a photographic tour of Fallout 3's version of the inauguration site a couple of weeks ago, and it's provocative imagery, whether deployed in an explicitly political context or not. As far as I can tell—I'm no expert on Washington or especially its suburbs, though I've been in the city a few times—the use of D.C. as a setting mostly works out, and things are basically where they're supposed to be. Someone who's actually lived there, like Bobby of the GameCulture Journal Blog, who wrote this excellent post on Fallout 3's metro system, can talk about this far better than I can. The monuments and museums are there, and that's interesting, of course. The first view of the outside world, when the player exits the vault, takes in a crumbling Washington Monument that stands miles away from the player's position, across an apparently endless and imposing waste, and this is both beautiful and terrifying. Getting into the city (eventually), the player finds Arlington National Cemetery, the National Mall, the Capitol, the Jefferson Memorial, and various other famous sites, right where they're supposed to be, just in a state of advanced disrepair. What's really been amusing to me, though, is running across the less obvious Washington sites, ones that you'll have heard of and visited in the past, perhaps. For instance, the game's developer and publisher, Bethesda Softworks, is based in Rockville, MD. Rockville is a bit outside the scope of the in-game world, but if you walk out towards Rockville in the game, you'll eventually come across a place closeish to the real-world Bethesda, MD, which includes "Bethesda Ruins," a depressing shell of an office park that's placed just about in the very spot where, in the real world, Bethesda Softworks operated until 1990. Friendship Station is a ruined metro stop that corresponds roughly to the Friendship Heights neighborhood in the real world. Dupont Circle is in the game. The Georgetown neighborhood is sort of where it should be, as is the Chevy Chase neighborhood. The missing element, of course, is the usual set of the mechanisms of civilization. Or anyway, there are none of these in the game that would be familiar to us. Fallout 3's version of Greater Washington has been sliced up into several sections. In the most straightforward terms, these sections are owned, settled, occupied—whatever—by various groups of people who, in the absence of any "official" authorities, serve as the authorities in their respective sections. The few forms of governance that exist are fragile: in Megaton, one of the first settlements the player is likely to find, the most visible authority figure is Lucas Simms, the town's self-appointed sheriff. But during one available quest in the game, it is quite likely (as has happened in the game I'm playing) that Sheriff Simms will be shot and killed; no other characters will ever step in to take his place. Even when Simms is alive, though, other inhabitants of Megaton will speak frankly to the player about him and call into question whether he is an entirely legitimate agent of the law. Their criticisms are mild, though, and all those who do point out the vigilante nature of his position nevertheless express that they are willing to go along with the situation. His presence certainly doesn't seem to make living in Megaton any less safe. The player may find it easiest to associate different locations in the game world with the inhabitants or, where present, the governing authorities that appear in those locations. So the freeway overpass community of Arefu "belongs" to Evan King and his neighbors; Megaton "belongs" to Lucas Simms and its other citizens; Tenpenny Tower "belongs" to Allistair Tenpenny, Chief Gustavo, and its other residents. This is certainly the most obvious way, aside from nomenclature, of thinking of different locations, and it facilitates gameplay in general and navigation in particular by allowing the player to "put names to faces." But these are almost never the only people interested in any given location in the game. The fortunes of the characters in Fallout 3 are always in flux, and much of the territory in the game is contested. Although at the game's outset Megaton is, again, "owned" by its various inhabitants and its sheriff, the player can undertake a quest that requires the detonation of a live but unexploded nuclear bomb that acts as something of a war memorial/religious object in the center of the town. This quest is performed at the behest of Allistair Tenpenny, an enterprising man who owns a converted hotel in the Capital Wasteland. Tenpenny wishes to eliminate Megaton and its inhabitants simply because he is disgusted by their existence. The residents of Megaton, meanwhile, tell stories of the town's early days, when pieces of abandoned airplanes were brought in from a nearby airport (Reagan?) to construct a barrier to protect settlers from bands of raiders; this barrier now creates the small town's outer boundaries, and it's still crucial as a means of protecting the townspeople from the predatory raiders. The violent clash of incompatible interests, often over one group or another's claim to a given section of the Wasteland, is common in the game. Portions of downtown Washington are the sites of skirmishes between an organization known as the Brotherhood of Steel and gangs of mutants; the community of Arefu is apparently suffering from a string of attacks by a group of vampires. Many spots on the map that aren't major settlements are defended by pockets of raiders who will attack the player on sight. The game plays out in the midst of all of this confusion, which is precisely what you'd expect from the post-apocalyptic setting: in the absence of the traditional authorities, people either improvise new societies, or they assault the ones that already exist, looking for easy gain. One of the most satisfying features of the RPG genre is the ability to pick an "alignment," some sort of moral or ethical outlook you intend for your character to follow, and to stick to it throughout the game. Of course, in an older Japanese RPG like Final Fantasy, this doesn't mean much, as dialogue choices are limited and there are only so many things you're free to do in the game. But many more recent Japanese RPGs and so-called western RPGs have presented the player with some sort of system for negotiating the game in accordance with the player's preferred moral alignment. One interesting example is Baldur's Gate, a 1998 RPG that gave the player a party of up to six characters to play with. Baldur's Gate actually presented opportunities for mixing together characters who wouldn't necessarily get along, like evil and good characters. In the most extreme case, the player could form a party with a good surface-dwelling elf and an evil, cave-dwelling dark elf, each of whom hated the other intensely. The two would exchange heated words throughout the game, and in some games, they would even fight each other to the death. Naturally, the post-apocalyptic setting is the perfect landscape for this kind of moral navigation. Apart from any sympathy the player may develop towards the game's NPCs, there's little reason to accept the cobbled-together bodies politic of the Capital Wasteland as anything more than arbitrary constructions. The player has the freedom to prop up these tenuous systems or to undermine them and use them to advance his or her interests within the game. Most quests even have multiple ways to approach individual solutions, often one that's violent and one that's peaceful. A group of outcasts asking for help getting access to Tenpenny Tower can use the player's diplomatic skills, or they'll just as happily accept his or her help in shooting their way into the building. A crafty player might even devise a plan to loose feral humans on the tower's wealthy residents, clearing it out for the outcasts' use. Many of the game's quests offer alternatives that are mildly sickening, like the quest where the player is asked to detonate the nuclear bomb in Megaton. Fallout 3 is a dark game, set in a world that I personally have found it upsetting to visit for too much time in any one play session. It's a world filled with desperation, unquestionably a world that offers more enticing and easier rewards to the player who's willing to play the game "evil" and often handicaps the player who insists on playing "good." The sad state of things in any given place in the game world doesn't create much incentive to maintain the status quo, and it's easy to feel the draw of nihilism. Don't get me wrong: there's humor here, too; there's a whole world in Fallout 3, and as Denis Farr points out, some of the details in this messed-up land can bring a smile. I can't help feeling, though, that the majority of the responses the typical player of Fallout 3 will experience will fall somewhere in the range between "disturbed" and "repulsed." Many of these responses will come up as the player thinks about how to conduct him or herself in the Wasteland. There's as much wide-open play area morally, I guess I'm saying, as there is geographically. As Karen Green asked in a column about Robert Kirkman's zombie comic book The Walking Dead, "What is the role of government in crisis (a timely question) and what does society become when that role has been well and truly abdicated? Do people change to adapt to extreme events, or do the events change the people? When do the ends justify the means? What does it take to make someone a survivor?" I wrote in the first "Whapocalypse?" entry about the suitability of the zombie genre to the signature Valve-style FPS. The reason I started this series in the first place was because I've been interested in some of the same questions Karen asks, or at least I've been interested in the way those questions have been explored recently in the medium of video games. The answers I've found in Fallout 3 weren't always the ones I would've wanted to find if I'd had a choice. Still, the game is horribly compelling; I'm simultaneously anxious and terrified to return to Fallout 3's Washington. I've yet to talk about how close to each other on the genre tree these two branches are, the zombie story and the post-apocalyptic story, but that's one of the other big reasons I began writing this series, and it's an issue that's been working its way through my head lately, too. Next time I revisit this topic, I'll have something to say about that. Till then, as always, thank you so much for reading. Beantwortung der Frage: Was ist Nuclear Houseplant? I apologize for the title of this post. I apologize to you, and I apologize to Immanuel Kant. I won't be this pretentious again. I also apologize for what I'm about to do, because in this post, I'm going to violate a standard I thought I would uphold forever. I am going to explain the new title of the blog. There are two reasons for this. First, several of my readers are non-gamers. They're nice friends and colleagues who have the kindness to read this blog even when it's not about anything they're particularly into. And sometimes they even find something to say! So they deserve an explanation, I think. Second, the rest of you probably think I'm a blooming idiot for calling the blog "nuclear houseplant" and then tacking up a sprite of Chuck the Plant. "Chuck the Plant isn't nuclear," you say. "That other houseplant, the one upstairs, the one you give the radioactive pool water to, that one's a nuclear houseplant!" I know. It's an outrage. You'll want the explanation right away, I'm sure, so skip down past the next three paragraphs, if you would. Non-gamer friends, this stuff comes from a game called Maniac Mansion. It's an old game by Lucasfilm (later Lucasarts), one I first played on an Amiga and first owned and finished on an NES. The game is a brilliant send-up of B-grade horror movies, mostly, and it is clever and hilarious and minutely detailed from beginning to end. In terms of gameplay, though, its real appeal lies in its clever mechanic: at the beginning of the game, the player is assigned one and selects two additional unique characters, all teenagers out to rescue the first character's girlfriend. None of the characters has a skill-set sufficient to complete all the game's puzzles, and in fact, each character has one special skill the player has to take advantage of to finish the game. So all the way through, the game requires the player to position characters strategically, figure out each character's special skill, and have the characters cooperate with each other. I may have more to say about this someday. Well, in the course of this adventure, among several other seeming game non-sequiturs—items that exist for no apparent reason—the player eventually finds an unassuming little potted plant sitting on a shelf. If the player moves the mouse pointer over the potted plant, it becomes obvious that this plant is named Chuck the Plant. But Chuck never does anything significant: he sits on the shelf and brightens one room in the game and that's it. I really did think you could talk to Chuck, but I think that's only possible in another game that includes Chuck the Plant as a reference. Now, there is another plant in the game that's quite important. This one is an unnamed carnivorous-looking plant on the third floor of the mansion. The plant needs to be used as a ladder (the gamers can vouch I'm not making this up) so that the kids can reach the attic, which has no stair access. So what the kids have to do is use a jar to gather water from the swimming pool out back, which doubles as a cooling vat for the rods in the house's nuclear reactor. They then pour this water in the carnivorous plant's pot, causing it to mutate and grow tall enough to allow them to reach the ceiling. But it's still hungry, so they have to give it some Pepsi to get it to go into a burping spell. Then they can climb the plant to the next floor. So here's the thing. One plant in Maniac Mansion is "nuclear," and the other plant is Chuck. I don't have them confused, though according to the Wikipedia article on Chuck the Plant (! ), some people do find it hard to keep the two straight. I just mashed them up and came out with a title that I thought was fun and short and a graphic that I thought went with it. So why not just show the actually radioactive plant? I didn't need to use Chuck, after all. Well, Chuck is one of those weird things. He's in the game, and there's no reason for him to be there, but he is, and he even has a name. Chuck the Plant. To my nine-year-old brain, the fact that that plant was clickable and had a name was fun and satisfying out of all proportion. It's one of those details that shows the love that goes into some games, I guess, and Chuck must have been one of the first details of that kind that I noticed in a game. In some ways, it's because of Chuck that I'm writing this now. Speaking of which, how about I stop now? Thanks for reading, and I hope you enjoy Nuclear Houseplant.